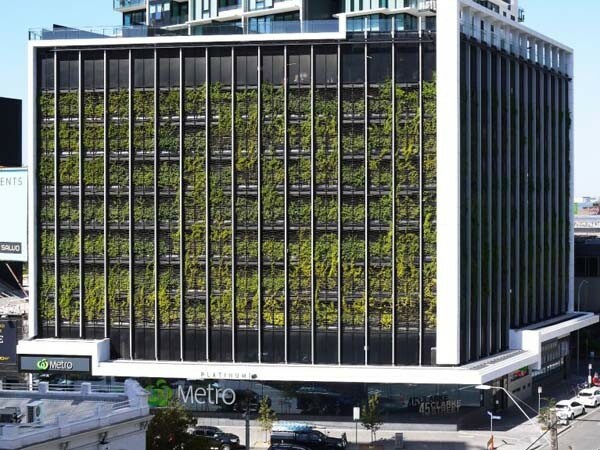 Leading garden wall and sustainable vertical garden specialist Fytogreen relies on cabling and stainless steel mesh systems from Tensile to support their green façades. Established in 2002, Fytogreen began operations with the manufacture of roof garden soil featuring a lightweight consistency to reduce the load on a building’s support structure. Over the years, the company has completed over 200 successful green wall projects in various parts of the world including Australia, New Zealand, California, Singapore and Dubai. Fytogreen also developed a lightweight, mineral based soil for their roof gardens. For their vertical garden system, Fytogreen uses hydroponic foam with no soil particles to move or organics to decay. These ecologically sustainable vertical gardens allow plants capable of functioning within the design of the vertical garden system to live out their natural lifecycle. For projects involving green facades, Fytogreen uses planter boxes specifically designed for the use of their lightweight soils or hydroponic panels supported by Tensile’s cabling and stainless steel mesh systems. Tensile Design & Construct has specialist experience in installing architectural mesh, cabling and rigging systems for plant life. The company has a high level of expertise in green facade projects. Fytogreen has been working with Tensile on several green facades beginning with a project for Medibank. Thanks to their collaborative partnership, the two companies have been able to develop new technologies capable of working with one another’s product. While Tensile quickly discovered Fytogreen’s experience and expertise with the horticultural elements of green facades, Fytogreen saw the potential of working with Tensile on more projects because of their knowledge of structural equipment, which can support a vertical garden environment. Following the Medibank project, Fytogreen and Tensile constructed an eight-storey facade for Platinum Tower (City Road Southbank), currently the largest green facade of its type in Australia. The two companies often recommend the other when called in to design a project for a client. In this seamless working relationship, Fytogreen provides horticultural research and design, installation and maintenance of horticulture products while Tensile designs, installs and maintains the cabling, rigging, and structural support. Clients, in fact, have been able to achieve cost savings thanks to this unique partnership. Fytogreen and Tensile are able to offer the most affordable method of green facade installation while maintaining the original aesthetic of the project’s concept. In this way, the companies meet all client expectations while also reducing the overall cost.